Puerto Rico's Growing Financial Crisis Threatens Health Care, Too : Shots - Health News Unless Congress and the White House can agree on a funding fix for Medicaid in the U.S. territory, many worry that Puerto Rico's health care system could collapse when stopgap funding ends next year. 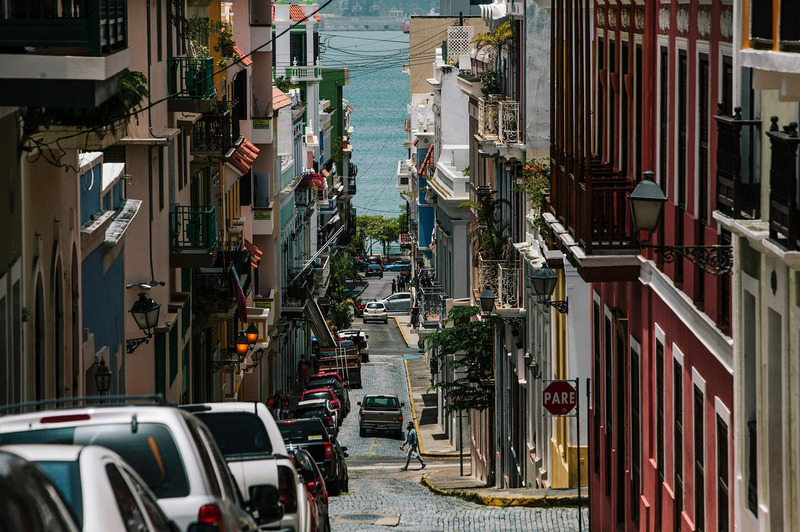 Blue skies in San Juan, Puerto Rico belie the U.S. territory's struggle with massive debt. The islands have a generous health care program that covers nearly everyone, but economists say it has never been adequately funded. Still, as Cruz would be the first to say, right now is not a good time to be in the hospital business in Puerto Rico. A nearly decade-long recession has taken a severe toll on the island's economy. Half of San Jorge's patients are on Medicaid now, up from a fifth just a few years ago. And, for decades, the U.S. government has capped Medicaid reimbursements in Puerto Rico at a level far below what states receive. Cruz says that cap has forced his hospital and many others to cut services — he's had to close two wings and 40 rooms. He only managed to avoid staff layoffs, he says, by freezing 100 open positions — doctors, nurses, technicians and support personnel. And last year, when Puerto Rico ran out of money and couldn't make a $250 million payment to hospitals, San Jorge was forced to reduce hours and cut pay for all employees. Since long before the advent of Obamacare, Puerto Rico has had a health care plan that covers nearly everyone on the island. Sergio Marxuach, public policy director for Puerto Rico's Center for a New Economy, says it's a generous plan, but has never been adequately funded. "It has become, in a way, the third rail of Puerto Rican politics," Marxuach says. "Nobody wants to touch benefits. Obviously it's very politically sensitive. Low-income residents love it. So, it's going to be very hard to modify unless we get additional Medicaid funding, or somehow get some sort of fix that we can do locally." The head of Puerto Rico's Health Insurance Administration, Ricardo Rivera-Cardona, describes it in another way. "There's a saying here in Puerto Rico," he says, "which, if you translate literally into English, is 'You are against the wall and the knife.' "
Stopgap funding for Puerto Rico's Medicaid system that the Affordable Care Act has provided will run out next year. The Obama Administration has proposed a solution: removing the Medicaid cap, and giving Puerto Rico the same level of funding that goes to the states. If Congress doesn't take action on that proposal soon, Rivera says, Puerto Rico will face tough decisions on how to provide care for 1.6 million Medicaid patients. "We are looking at one million people that will have to be forced out of the Medicaid system," Rivera says. "The remaining 600,000 will have to experience a reduction in benefits and an increase in deductibles and copays." That's a problem in a territory where the median household income is about $19,000 — half that of Mississippi. Across Puerto Rico, clinics are closing, and at least four hospitals have filed for bankruptcy. If enough hospitals close, those remaining will be overwhelmed, say Puerto Rico officials. By the end of this month, leaders in Congress say they expect to have a plan ready to help Puerto Rico. The U.S. territory is mired in an economic recession and is more than $72 billion in debt — a debt that Puerto Rico's Gov. Alejandro Garcia Padilla says the island can't pay. But the chronic underfunding of healthcare is an even more pressing crisis, according to officials in Puerto Rico, who worry that the islands' health system could collapse if that lack of funding is not addressed this year. Leaders from the U.S. territory have made regular trips to Washington in the last two years to alert members of Congress to the looming crisis. But Cruz, the hospital vice president, says Puerto Rico has an inherent problem. "Unfortunately, we don't vote. And if you don't vote, you don't count," Cruz says. "When I visit the senators, they have a bunch of issues with their own state. So how much attention can [they] pay to a state that doesn't vote?" Officials in Puerto Rico say that as much as a third of the territory's massive debt is the result of health care costs. That's why many believe that to fix Puerto Rico's overall financial mess, you must first fix its health care system.